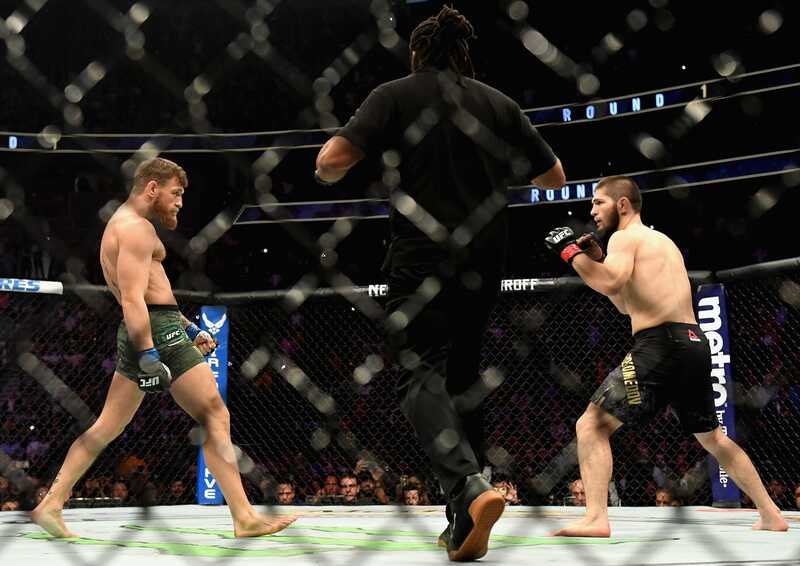 Photo by Harry How/Getty ImagesConor McGregor and Khabib Nurmagomedov prepare to engage in combat. Conor McGregor and Khabib Nurmagomedov have been slapped with extended suspensions until an investigation into the post-UFC 229 brawls is complete. The Nevada State Athletic Commission, which is looking into who was involved in the October 6 episode, has ordered both fighters to attend a disciplinary hearing on December 10. Failure to show up at the hearing means they will never be allowed to fight in Las Vegas again. This could have severe ramifications to their status as marketable and commercial fighters, as Las Vegas remains the combat capital of the world. This ultimatum could therefore tank their careers. Conor McGregor and Khabib Nurmagomedov have been issued a stark ultimatum that could tank their careers. Both lightweight fighters have been slapped with extended suspensions until an investigation into the post-fight brawls that marred UFC 229 is complete, according to The Guardian. Nurmagomedov dominated McGregor in their UFC lightweight championship title fight at the T-Mobile Arena in Las Vegas on October 6. Nurmagomedov dropped McGregor with a thudding right hand in the second round before submitting him for good in the fourth. But rather than celebrate victory, Nurmagomedov was seen mounting the octagon fence and charging feet-first at McGregor’s cageside friend Dillon Danis. While that was going on a fight erupted in the cage as well, with members of Nurmagomedov’s team seen attacking McGregor. Nurmagomedov had his $US2 million guaranteed fight purse withheld by the Nevada State Athletic Commission, the sport’s governing body for fights in Las Vegas, while McGregor was paid in full. The Guardian reports that the commission has now released $US1 million of Nurmagomedov’s UFC 229 salary, but it has also told him he must attend a final disciplinary hearing in December. McGregor, too, must attend. Failure to show up will mean they will never be able to fight in the combat-sports capital of the world again – something that could have severe ramifications for their career. “They both need to be noticed that in [the] December hearing I will require them to personally appear,” the commission’s chairman, Anthony Marnell, said at a hearing on Wednesday,according to TheMacLife.com. It is at this December hearing that McGregor and Nurmagomedov will find out their final punishments. Marnell stressed how important it was that both fighters personally attend the hearing. “If they want to fight here again, they will be here in person,” he told TheMacLife.com. 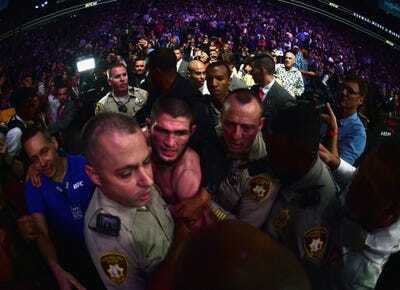 Photo by Harry How/Getty ImagesNurmagomedov was led out of the arena by the police after the UFC 229 brawls had finished. It is not just McGregor and Nurmagomedov who are in hot water with the NSAC. MMAJunkie.com reports that anyone else found to have been involved in the UFC 229 brawl would be subject to punishment. Marnell told MMAJunkie.com that any of Nurmagomedov or McGregor’s team members “will have action brought against them” if they participated in the brawls. The disciplinary hearing is scheduled for December 10.